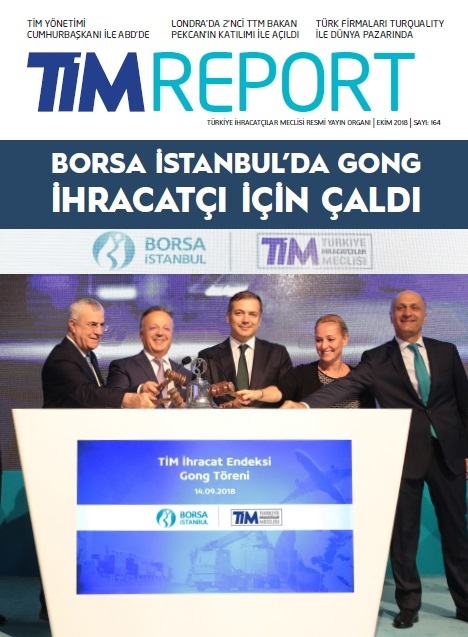 TİMREPORT monthly magazine of Turkish Exporters Assembly (TIM) is the most comprehensive magazine about the real sector. TİMREPORT readers are exporters, representing a Turkey's economy in foreign trade with the $ 150 billion in 2016, exports and imports of $ 130 billion the total of 215 billion dollars. Exporters who are driving force of Turkish Economy created 65 percent of Turkey's economy. That Timreport is taking pulse of the export. From Electronics to the ready-made clothing, from automotive to chemistry, all of the performance of sectors, export data, can be followed TİMREPORT. monthly with the latest news and global development. Family of Timreport consist of 60 Turkish Exporters' Associations and more than 67.000 exporting firms, continue their activities under the umbrella of Turkish Exporters' Assembly. Click here to read the last edition.